Teachers, humbly step aside and consider how to really get the student, teacher and technology partnership to work. Becoming a teacher might not be on everyones bucket list, but after watching eight year olds teaching eight year olds about native american life, I hope they realise just how powerful the ability to educate someone really is. Being in charge of other peoples learning was a new experience for these third graders. I’ve been thinking about this for a while. When I saw this post during the #1to1techat on Twitter I finally knew how to phrase it. How do you know how much you know? To find out – teach it to someone else. Our next challenge? If our students are able to become independent learners working towards becoming facilitators of learning, then where does that leave us as the “real educators” in the classroom? The massive outpour of information as well as the technology to harness its power actually leaves educators with a very powerful and humble mission. It empowers us to help students become caring, thoughtful, and serious learners. If we choose to answer this calling and put aside our slightly bruised ego and title of ‘sage on the stage’, then the student, teacher, and technology partnership can begin to create some truly awesome results. When gauging thoughtful use of technology, one of the questions that educators must ask, is how the product of learning is used after it has been completed. Technology tools give our students the ability to do so much more than simply accomplish tasks and turn them in. With Book Creator student learning comes alive and gives others a very engaging and interactive learning experience that impacts almost every one of their senses (smell coming soon?!). I have seen Book Creator act as a catalyst for meaningful learning for 2nd graders as they create audio recordings to assess reading and speaking skills, and photograph hand drawn pictures while studying the Torah/Bible section of the week. I have watched 7th graders create a grade level science journal reflecting on their week long scientific expedition in the Olympic National Forest in Washington State. 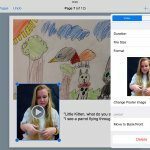 With a simple interface, powerful features, and multiple sharing options, it is clear why Book Creator is the go to app for so many educators embracing technology use in the classroom. This project was a collaboration with Deborah Littman and Joanna Benporat and their 3rd grade classes. The initial planning phase of the project went very routine. Questions of purpose, time spent, objectives, and curriculum alignment were asked. Questions about student’s understanding of the applications of choice were answered. We estimated the project would integrate technology between the A and the M on the SAMR model due to its use of audio-visual capabilities as well as how the technology would allow the learning to be shared. The objective of the student was to demonstrate their knowledge of a Native American tribes to the class. After reflecting on the final outcome of the project, we compared the project’s use of technology to how the project was accomplished by traditional means. Now each one of these skill sets that students developed during this project have a specific objective. Through the use of audio recording and filming, students had the ability to clearly and effectively share their learning with other people in an engaging way that gave the viewer a sense of choice. The traditional method consisted of students presenting in groups in the front of the class reading from index cards. The traditional method consisted of hand made poster boards and dioramas. In the past digital slideshows such as PowerPoint were used as well. Using the iPad students could create an audio-visual multimedia presentation that incorporated hand made artifacts into the project. Many of the traditional methods of learning were still utilised by students including reading from books, note taking, and basic researching. The information was internalised further through the use of multimedia such as audio record, video filming, drawing, and creative writing. Through the use of technology, this area yields unbelievable results in respect to frequency and sustainability of student partnerships. Students in traditional group projects tend to have one dominant student or have other students who lack motivation to fulfil their group responsibilities. Through the use of the iPad students were able to work independently, build off each others ideas, and help their peers create better quality work. At this point in our 1:1 program the “iPad excitement” has worn off. Students were engaged on a much higher level due to the personalised learning experience that allows for independence, choice, and serious ownership over their work. Students were not only enthusiastic to create something their peers would see, but even more so when they worked on traditional worksheets answering questions based on viewing their peers projects. This is a hit or miss with technology. Technology in of itself doesn’t make either of these qualities shine, but with the proper mindset students can use technology as a powerful tool to develop these critical skills. Having all their work in the cloud to work on at home and use the iPads together in class did contribute to success in this area. This was the best part of the entire experience. Students were on inspirational fire as they shared their learning and made sure students understood the valuable information that they had learned. Students concluded this unit with an in-depth understanding of a specific piece of the unit, as well as a general albeit superficial understanding of the rest of the unit due to their peers amazing ability to share their learning in a serious, but fun and engaging way. Rabbi Michael Cohen is currently the Director of Educational Technology at the Harkham Hillel Hebrew Academy in Beverly Hills, Los Angeles. Michael is the creator of the “Invisible iPad” approach to technology use in education, a topic on which he has presented at several EdTechTeacher conferences, institutions, and recently has been featured on MindShift. He’s also a Book Creator Ambassador.